Nathan Valancourt must protect his beautiful ward from a vampire killer. As the battle unfolds, their true heritage is gradually revealed, offering hope of redemption. Lord Nathan Valancourt is stinking rich, a darling of London's social set in 1893 and a notorious womaniser. He had never believed in the supernatural but when a vampire killer masquerading as a clergyman begins haunting his dreams and forcing him to endure visions of the murder of his previous female conquests, Nathan determines to amend his frivolous ways. When the killer turns his attention to Nathan's beautiful ward, Juliet, Nathan is anxious to protect her. As they battle the monster, Nathan and Juliet gradually realise that they share a psychic connection. This close bond triggers the discovery of their true heritage as descendents of human-vampire unions and leads to the gradual revealing of powers beyond their imagination that offer them hope of victory. 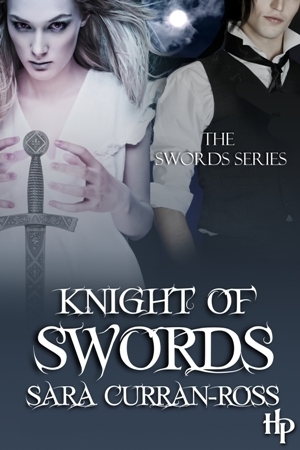 This is the first in Curran-Ross' The Swords Series. Jack the Ripper isn't the only monster on the streets of London in the 1890s. Sebastian, a very powerful and sadistic vampire is obsessed with "his" Juliet. Nineteenth century London, vampires, demons, a villan, a womanizer, a virgin, an obsession and a love destined to be from birth. All the makings of a historical paranormal romance, right? Well... while set in 1893 London, this is not a historical period piece. It has a very dark and somewhat confusing beginning and finishes much like a Clive Barker or Stephen King horror story. It might be loosely considered a paranormal romance with a heavy dose of horror. Curran-Ross has created a totally new vampire mythos with this series. Enter the world of the Taleians - vampires and vampire hybrids who have a weakness to iron and animal blood but whose females have the ability to heal human sickness and ailments. There are two clans of Taleians: Morrigan (royal/rulers) & Breanainn (elite royal warrior/protectors). Juliet finds herself after many years of thinking she was human, changing. She is in realty a Talian Morrigan hybrid chosen at birth to be Queen of Taleians. Nathan, a favorite of the ladies, never even considered that he may be anything other than human when he finds himself changing into a Talian Breanainn hybrid chosen at birth as Juliet's protector/counselor/mate, her Knight of Swords. When Sebastian is able to trick Juliet into giving herself up to him, Nathan and Juliet are dropped into a world of horror. But is it the Taleians or the humans who are the monsters of this tale? Curran-Ross has quite a twist in store for readers in this tale. One I didn't see coming. But note there is no HEA ending here and the story ends without resolution which apparently continues into the next book in the series which should be out later this year. Paranormal romance fans may not be comfortable with this story while horror and urban fantasy fans should feel right at home.